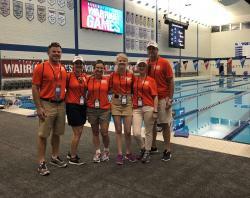 For the second consecutive year, Astellas employees used the company’s Volunteer Time Off program to volunteer at the 2018 Department of Defense (DoD) Warrior Games where Astellas also supported the event by providing meals for the athletes. More than 50 employees, family and friends gathered at the U.S. Air Force Academy in Colorado Springs, Colo., and helped staff the information booth, access and family-point-of-contact areas and medal ceremonies to make the event as successful and rewarding as possible for athletes and their families. Approximately 300 wounded, ill and injured service members and veterans competed in 11 sports during this year’s Warrior Games, representing the United States Army, Marine Corps, Navy, Air Force, and Special Operations Command. Athletes from the United Kingdom, Australia and Canada also were 2018 competitors. Teams included active-duty service members and a small number of veterans with upper-body, lower-body, and spinal cord injuries; traumatic brain injuries; visual impairment; serious illnesses; and post-traumatic stress. Last March, the Defense Department honored Astellas with its top Employer Support of the Guard and Reserve (ESGR) Award for its “exceptional support for national defense by adopting policies that make it easier for employees to participate in the National Guard and Reserve.” In addition to supporting the MERG, the company provides its military employees 10 days paid military leave for active service, and has an 11,000 square foot “Heroes Garden” at its headquarters. To learn more, visit the Warrior Games website.